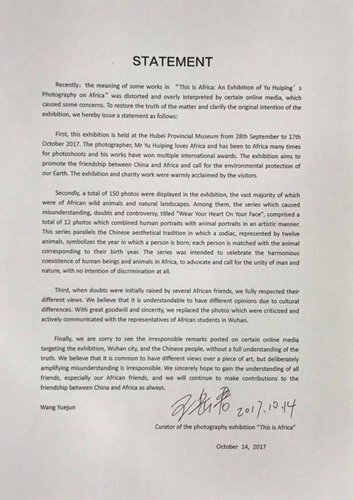 Statement from Wang Yuejun, curator of the photography exhibition "This is Africa." Members of the African community in Wuhan and in other parts of China are calling on a museum in Central China's Hubei Province to apologize for a photo exhibition that has the faces of Africans, including young children, next to wild animals. After receiving complaints about the offensive nature of the images, the Hubei Museum in Wuhan removed the photos on Wednesday. Wang Yuejun, curator in charge of the exhibit, called the complaints "overreactions" and declined to apologize, insisting that they had done nothing wrong. "We did not intend to discriminate against any culture," said Wang. "The Chinese have a tradition of association with animals, such as the 12 zodiac animals. The photos just call for harmony between humans and animals," he stressed. The exhibition titled "This is Africa" was scheduled to open from September 28 to October 17, with 150 photos from the African continent on display. It is 12 of them, titled Xiang you xin sheng (meaning "face comes from heart") that are at the heart of the uproar. Members of the African community in China said that juxtaposing the images of Africans with animals suggests that blacks are animals, saying it is a very offensive stereotype and encourages the perpetuation of racism. "I saw it as disrespectful. I felt they really disrespected the African people and misrepresented Africa," said Samantha Sibanda, a Zimbabwean and founder of the Appreciate Africa Network. Wang said his team had spoken with some African students in Wuhan about the complaints and that some of them said "they could understand." Amid the outcry, the museum's deputy director surnamed Zeng said the photos and design came from the sponsors and they only provide the room.